Three political leaders have taken centre stage at the Congress Hall on the third day of the World Economic Forum’s Annual Meeting in Davos. Each of them outlined their vision for the future of the Europe. For two of them – Italy’s Giuseppe Conte and Spain’s Pedro Sánchez – it was the first time they had taken to the stage, having been appointed as Prime Ministers last year. To some extent, they feel like Europe’s next generation of leaders. But for Angela Merkel – who has already announced she will step down in 2021 having been the Federal Chancellor of Germany since 2005, it felt more like the start of a goodbye. These are their key messages. “A sense of despair is spreading. Even the middle class is facing poverty. Everyone feels that tomorrow will be worse than today,” the Italian Prime Minister said. Our experience might be an indication of what Europe will look like tomorrow,” he said. Conte proposed some urgent interventions to “heal our severe social wounds”. These include citizen income and a flexible retirement age. But he says there needs to be a much bigger intervention in order to get rid of inequality and injustice. For that, he says, there needs to be a rewriting of the rules to give the power back to the people. 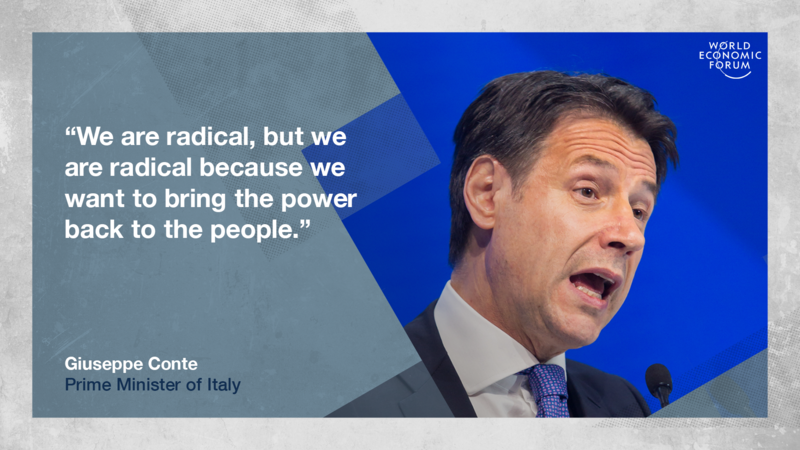 He ended his speech by saying that Italy did not want to walk the path of change alone. Europe would be much stronger in upholding the original dream of Europe, he said. Germany’s Chancellor took a more optimistic view, pointing to the fact that the world is a much better place with far less poverty than in 1971. And she urged people to think beyond their narrow national interests and to reform global institutions with a view to achieving “win-win” outcomes. She acknowledged the challenges of both Brexit and migration, and also warned that the economy would need to be strong in order to compete on the global stage. “We see today how economic strength is effective,” she said, pointing to sanctions on Iran and the effectiveness of US foreign policy. “Then the question arises: how can we in the eurozone become as dominant? How can we arrange it so that we have economic weight on the scales… you have to be economically strong to assert yourself,” she said. Spain’s Prime Minister started his speech by warning that we are in danger of forgetting the lessons learnt from the 2008 financial crisis. And a key theme of his message was to remember that the economy should always be at the service of the people. If inequality is not addressed, he warned, nationalist policies could drag people back towards disaster. The solution he says, is for politics and economics to work hand in hand. « Does the sharing economy truly know how to share?